“The story of American immigration is universal; yet, each immigrant community has brought along a unique culture and a history, now entwined into what Walt Whitman called the ‘composite American identity of the future.’” American Moments: The Legacy of Greek Immigration is an exhibit currently on display at the National Hellenic Museum which effectively communicates the unique story of Greco-Americans from the late nineteenth century to today through the use of videos, photographs, artifacts, interactives, and audio oral history accounts. Following a linear and roughly chronological format, the overall argument of AmericanMoments is the notion that Greek immigrants, while determinedly preserving their own heritage, were nonetheless successful in assimilating to American culture and have since then had a profound effect on the nation’s history. While the exhibit is celebratory and focused on the Greek immigrant narrative, the introductory label asks every visitor regardless of their ethnic background to contemplate the trials and hardships of all immigrants past and present through the lens of the Greek immigrant experience in the United States. This statement is crucial for it actively engages visitors of all ethnic backgrounds to consider questions and construct parallels either to their own immigrant ancestors on a personal level or to contemporary immigrants today; “through a long process of struggle, failure and success, immigrants became Americans and their various cultures became integral parts of the American mosaic” Thus, American Moments: The Legacy of Greek Immigration, is a scholarly and engaging exhibit that all people, not simply Greeks, can enjoy and appreciate. American Moments: The Legacy of Greek Immigration opens with a video montage of various photographs and oral history accounts accompanied by an introductory label describing the bankruptcy of the Greek government in 1893 that led thousands of Greek men to immigrate to America. What follows is the first exhibit section label entitled “Crossing the Atlantic; Arriving in America.” Various photographs of Greeks immigrants coming to America are accompanied by descriptive captions on the wall and artifacts significant to the journey across the Atlantic such as a typical chest and a traditional Greek shepherd’s coat known as a kappa. The complement of relevant two and three dimensional primary source objects is typical of all exhibit sections and provides sufficient evidence to support the exhibit’s main argument. In the next section entitled “Spreading through the Nation,” visitors first learn the realities of being an immigrant adjusting to a large and unfamiliar place beginning with a photograph of immigrant tenement housing in New York City. Also evident through the photographs and captions is the Greek dream to own one’s business. Restaurants and coffee shops were commonly owned by Greeks in the early twentieth century, as were ice cream parlors and candy stores. The section ends with a replica Chicago street sign of Halsted, Harrison, and Blue Island Avenue, the center of once arguably the largest concentration of Greek immigrants in the United States. The “Delta” street sign acknowledges that the Greeks have arrived and the assimilation process has begun. In the following sections “Starting a Life” and “Keeping the Faith and Culture Alive,” visitors realize through audio oral history accounts as well as photographs and artifacts that Greeks were able to assimilate to American culture while at the same time preserving their own heritage. The subsections education and church contain photographs of Socrates and Holy Trinity, the first permanent Greek school and Greek church in Chicago. Captions state students were taught both in Greek and English, and the Greek Orthodox church was at the center of Greek community life. Additionally, the subsection organizations includes photographs and artifacts from the Greek Women’s Club and the Hellenic League for the Molding of Young Men; both would meet regularly at Hull House in the twentieth century. Finally, the section appropriately concludes with a large nineteenth century cloth embroidered with the American and Greek flag side by side emphasizing the exhibit’s overall argument and the Greek immigrant’s insistence that assimilation not mean the dissolution of their culture and heritage. The final section of American Moments is fittingly entitled “Legacy,” for it validates the tremendous impact Greek immigrants have had on the country. Photographs include the immigrant strikers at Ludlow, various Greeks who fought in the military, prominent Greek Americans in popular culture, and the Greek Orthodox Archbishop alongside Martin Luther King jr. during the fight for Civil Rights. 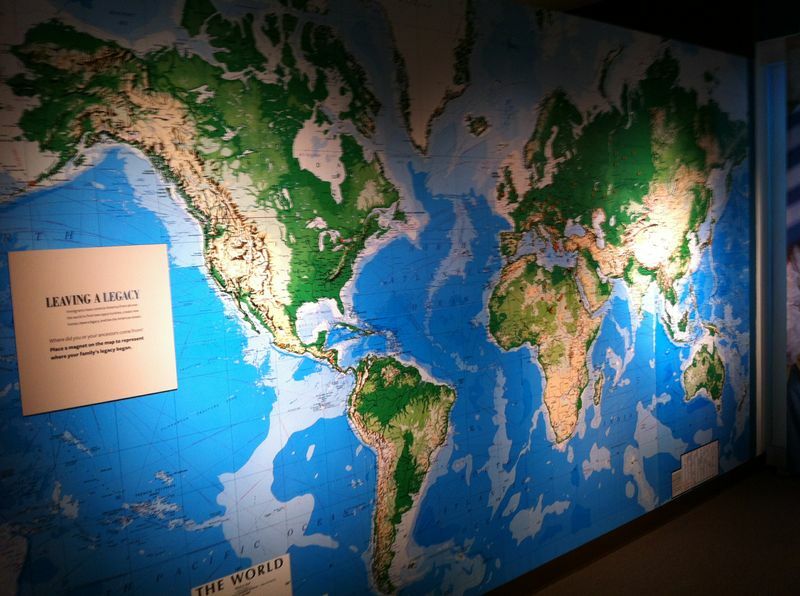 The exhibit finally concludes with a large magnetic map of the world entitled “Leaving a Legacy” in which visitors are asked to mark on the map where their ancestors came from. This interactive is successful incorporating non-Greeks into the experience of the exhibit and illustrates to all visitors the diversity of America. “Through the lens of Greek immigrants we learn what it took to find that opportunity and make a life in a new land, as immigrants continue to do so today.” The introductory label in American Moments accomplishes two important tasks. First, it engages all visitors to inquire by themselves or in a dialogue with others about their own immigrant ancestors. Second, it links the nineteenth and twentieth century immigrant experience of the Greeks to contemporary immigrants and the issues they face today. These two themes significantly broaden the audience for the exhibit and invite visitors to contemplate their current views on immigration. The objectives and overall message of American Moments as outlined at the beginning of the exhibit are clearly met and communicated throughout through the exceptional use of two and three dimensional primary sources as evidence. As a result, there is little reason to question the scholarly merits of the exhibit. The visitor leaves the museum with the notion that Greek immigrants, while preserving their own culture, were able to successfully assimilate and have an impact on American society. Yet, perhaps the most successful outcome for visitors of American Moments is not simply what they learn about Greco-American history but rather the questions and parallels the exhibit fosters about one’s own family history. National Hellenic Museum. American Moments: The Legacy of Greek Immigration. Chicago, Illinois: 2012.